This smart-looking cajon sounds great and has an impressive low-end response. However, it doesn’t come cheap and our review model suffered from a few cosmetic blemishes. From its original - and legendary - crescent tambourine, to bongos, congas, studio shakers and a host of innovative accessories for kit players, Rhythm Tech has earned itself a strong reputation in the percussion world. Today, we’re taking a look at the brand new Rhythm Tech Cajon, complete with Enhanced Bass Port. 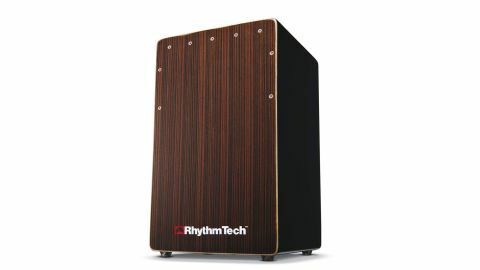 The standard size 30x30x48cm cajon features a smart two-tone faceplate, which combines walnut-esque dark browns in a vertically-striped woodgrain. The remaining body is finished in a smooth gloss black with curved edges that appear near seamless. The 41⁄2" sound port on the rear features a red plastic ring that recesses four inches into the cajon. Officially named the Enhanced Bass Port, this small addition is designed to amplify the cajon’s all-important lower frequencies. Guitar strings are used for snare response which, unlike many other cajons we’ve tried, do not appear to be easily replaceable. String tension can be adjusted using two hex screws located on the cajon’s base. Rhythm Tech bundles a tool with the instrument. A neat touch, removable velcro strips are placed over the strings for adjustable dampening. Despite looking good overall, the build quality lacks in places, and on close inspection we see small gaps along the top edge of the faceplate. We also notice poorly finished edges around some of the screws. Starting right at the top edge, the slap sound does not encourage much snare response, making it sound a little dead. Moving slightly further down the faceplate with the fingers brings the strings jumping to life, at which stage the cajon becomes incredibly responsive and delivers a crisp snare sound. As we head further down the tapa, striking just above the centre results in a hefty bass note. We’re happy to report that the low-end capabilities are certainly as advertised, almost definitely enhanced by that port. Small jingles can be found mounted on a wooden joist, which runs vertically through the inside of the box. These are not adjustable (or removable), but listening very closely it’s possible to hear a subtle sound that does actually contribute to the overall snap of the snare.